A few days ago, we talked about how Interactive Restaurant Technology systems are being adopted for your supper tables. Multitouch-tech company Ideum is considering a tad similar solution, albeit on a more familiar scale. 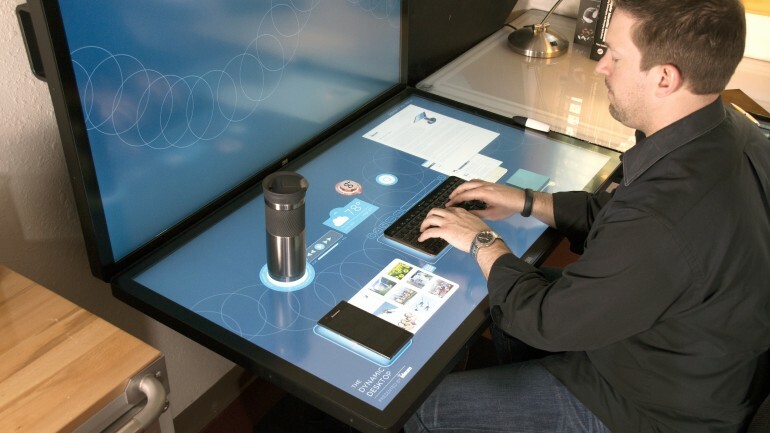 The result is aptly named Dynamic Desktop – a projected capacitive touch (PCT) table that will take over your conventional workspace. In other words, you can now interact with your desk devices and subsequent documents via a combination of simple hand gestures and touchable objects. And it this glorious ‘fusion’ of the physical and the virtual worlds that really tickles our senses. To that end, when you are at your work desk, sharing your photos to social media from your phone has always been a hassle in terms of micromanagement. However, the Dynamic Desktop completely traverses the scenario in which you would need to open your phone and go through the sequence of related apps. 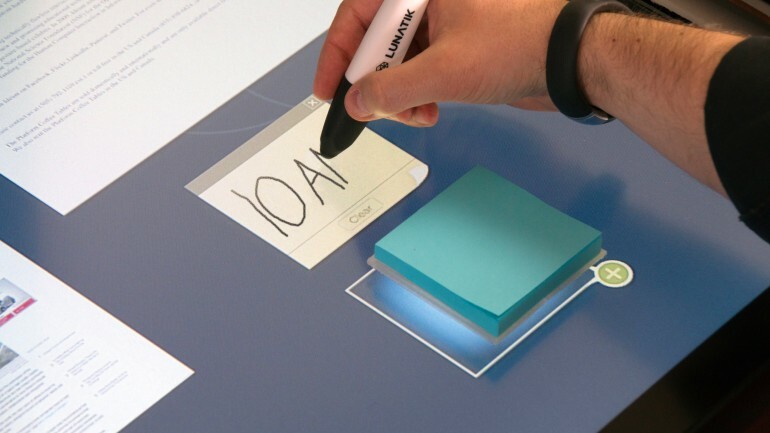 Instead you can just keep the phone on the desk, and an interactive gallery automatically emits from the smartphone’s screen onto the desk surface. Now you can drag and drop any image from this emitted projection into another social media icon (can be G+, Facebook, Twitter etc), which is also projected on the desk. Similarly, you can open up a work document from your phone (or any ‘smart’ physical object), and control it from the interactive desk surface itself. 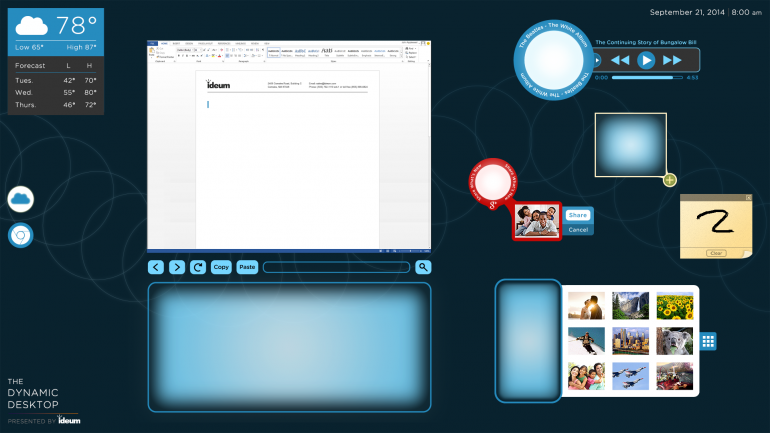 Additionally, the Dynamic Desktop will comprise of the more regular navigational icons by default; like for convenient accessing of the internet, weather widgets or so forth. And at last but not the least, the system will top it all off with its incredible ability to virtually augment mundane physical objects. For example, you can keep your simple paper-made notepad on the desk, and the desktop can replicate it on the surface and make it usable via a stylus (see below image). You can also keep your ever-trusty keyboard on the surface, and all the graphical elements will shift automatically to make room for the tangible object. Of course, till now we have been harping about the ideal scenario, but that doesn’t mean the technology itself is ideal. In that regard, the Dynamic Desktop will have limited capacity to recognize old physical objects, as it can only read objects that have so-called capacitive qualities (which come by virtue of conductive properties shown in materials like copper and advanced plastics). In spite of that, the progressive tech will have the advantage of recognizing at least a hundred different objects. Moreover, PCT screens have the ability to mitigate light interference and can be constructed with super-thin credentials. Finally, as for the commercial side of affairs, the Dynamic Desktop is still demonstrated as a proof of concept. However, there is more than a flicker of hope for the genuinely interested among us – the design is expected to make its debut through GestureWorks SDK, and might even make its full fledged retail appearance by next year.